Quasi modo géniti infántes, allelúja: rationabiles, sine dolo lac concupíscite, allelúja, allelúja allelúja. As newborn babes, alleluia, long for pure spiritual milk, alleluia, alleluia, alleluia. A little before 6 p.m. on that day, as my wife and I were preparing to take our dog for a walk, we received the news that Peter Hallock, founder of the Compline Choir, had died, shortly after getting back home from the convalescent center where he had been for several weeks. We drove as planned to Volunteer Park in Seattle, which is near St. Mark’s Cathedral, where I would go on to sing Compline that night. 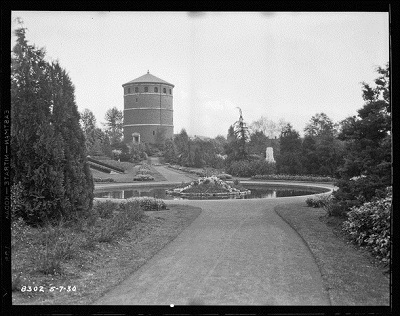 We walked in the venerable park, one of the many projects of the Olmstead brothers, which was completed in 1912. I was in a kind of daze – or shock – from knowing that my guide, friend, teacher, and mentor for almost fifty years had departed this earth. Many memories of times shared with him came flooding over me. I was happy that he was able to read about some of them in my book, Prayer as Night Falls (2013), which is dedicated to him. We walked by the spot where in 1969 I had come with a group of parishioners from Christ Church, Tacoma, to join with those of other parishes to picnic in the park, and then process to St. Mark’s for a communion service; it’s an annual event called “Cathedral Day.” As we entered the cathedral in 1969, Peter was there to greet us with a thundering improvisation on the four-year-old Flentrop organ. It was on a similar Cathedral Day in 1936 when the 12-year-old Peter Hallock first experienced the space of the building, was mesmerized by the sound of the organ, and knew his destiny was with that space and that place. We have all been blessed beyond measure by that day and that calling. 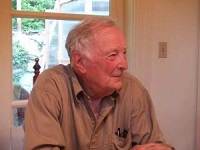 And from now on, the Second Sunday of Easter will have a new meaning for me – a day to remember the remarkable life of Peter R. Hallock, and especially his contribution to sacred music. Jason Anderson’s recounting of Peter’s last few hours, from Katherine Crosier’s blog. A wonderful tribute by organist Jonathan Dimmock. The texts of the offices of Matins and Lauds during Holy Thursday, Good Friday, and Holy Saturday have been the source of wonderful musical compositions, and I would like to offer several today. In monasteries and cathedrals of the Middle Ages, Matins and Lauds were ordinarily sung in the early morning darkness, with Lauds concluding just at sunrise. However, during the three days before Easter these two offices were chanted the previous day, after Compline, and while they were sung, candles were extinguished one by one, as a symbol of the death of Jesus. The last candle was hidden, then a loud noise was made to recall the earthquake, and the candle was extinguished, leaving the church in darkness (in Latin, “tenebrae”). 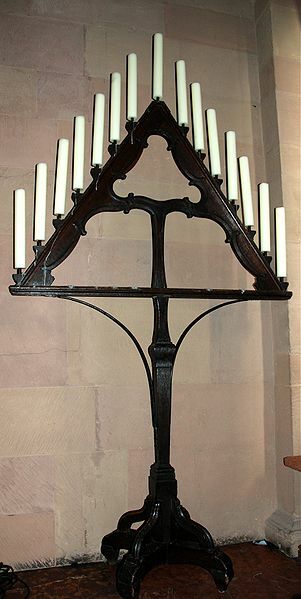 Imagine, if you will, the typical arrangement of fifteen candles on a rack (called a “hearse”), with a candle extinguished after every psalm – nine in Matins and five in Lauds – with the last candle remaining for the ritual at the end of the service. The Lamentations of Jeremiah have been the subject of many great compositions over the centuries. Listen to the setting by Peter Hallock, which is one of the musical examples in my book, Prayer as Night Falls. Sepivi te, et lapides elegi ex te, et ædificavi turrim. to have crucified me and released Barrabas? I protected you; I took away the stones, and built you a tower. I wish you a blessed Holy Week, and a Happy Easter! 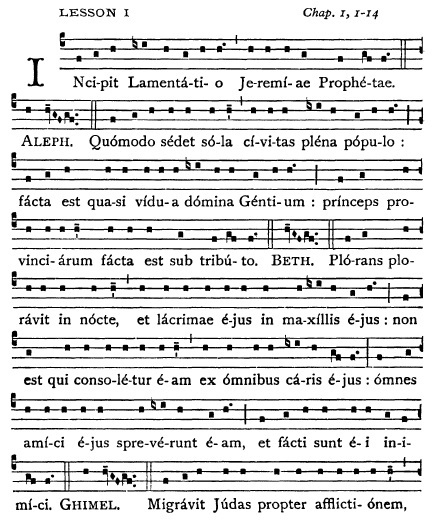 For the last five Sundays of Lent, the Compline Choir has sung as an anthem one of the many settings of the Lamentations of Jeremiah (in most bibles, the book of Lamentations comes right after the book of Jeremiah in the Old Testament). This has become a tradition over the years — the somber nature of the text and its theme of repentance lends itself well to the introspective season, with its culmination in Holy Week and Easter. We also sing simpler versions of the other parts of Compline during Lent, which gives us more time to rehearse these rather challenging compositions, most of which are from the Renaissance. The practice of singing from the book of Lamentations goes back to the Middle Ages, where they were the first three lessons (or readings) in the monastic office of Matins on Thursday, Friday, and Saturday of Holy Week. Matins was chanted in the early morning hours, and immediately followed by the Office of Lauds, which was timed to be sung at sunrise. In the old form of Matins, there were nine lessons in all, and they were chanted by a solo cantor. The Lamentations have a special reciting formula that is more elaborate than the other lessons. 1. Costanzo Festa (ca. 1485/90-1545), from our podcast of March 30, 2014. Heavy and thick, with antiphonal choirs, which comes as a contrast from the preceding verses of mostly solo duos and trios. 2. Jacques Arcadelt (ca. 1507-1568), from our podcast of April 6, 2014. Smooth, classic Renaissance counterpoint. 3. Thomas Tallis (ca. 1505-1585), from our podcast of March 16, 2014. My favorite Renaissance setting; note the solo high voice in a kind of dialog with the others, and the poignancy of major and minor sonorities. 4. Alphonso Ferrabosco the Younger (ca. 1575-1628), from our podcast of March 23, 2014. Clashes and chromaticism in this early 17th-c. setting. 5. Peter Hallock (b. 1924), from our podcast of March 9, 2014. Composition from the 1980s by the founder of the Compline Choir, Peter Hallock, with solo cello.